Avignon is a commune in southern France with a population of 89,300 in the city, itself, and a population of 290,466 in the metropolitan area. Founded by a Gallic tribe and later flourished under the Phoenicians and Romans, the town was later captured by the barbarians, followed by the Franks under Charles Martell. After a long period of semi-autonomy in the empire, Avignon finally came under French rule in 1251. Avignon is best known as the seat of the papacy in the fourteenth century, during which many of its historical buildings were constructed. After Pope Gregory XI migrated to Rome, two "antipopes," Clement VII and Benedict XIII, resided at Avignon, from which the latter was expelled in 1408. The town remained in the possession of the papacy, who governed it by means of legates, until its annexation by the French National Assembly in 1791. The historic town of Avignon—including the Papal Palace, Episcopal Ensemble, and Avignon Bridge—was designated a UNESCO World Heritage site in 1995. Besides the attraction of the town's historical monuments, the Avignon Festival, featuring theater, music, dance, and film, draws some 100,000 people each summer from around the world. Avignon is also immortalized in the French children's song, "Sur le pont d'Avignon" ("On the bridge of Avignon"), which describes the region's folk dancing. 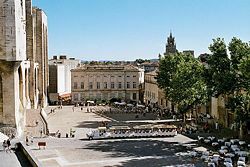 Avignon is the capital of the Vaucluse département. It is situated on the left bank of the Rhône, a few miles above its confluence with the Durance, 360 miles south-southeast of Paris, 143 miles south of Lyon, and 55 miles north-northwest of Marseille. Avignon occupies a large oval-shaped area, which is not fully populated and is covered in great part by parks and gardens. Avignon is subject to violent winds, of which the strongest is the mistral. The site of Avignon was settled early. The rocky outcrop at the north end of the town overlooking the Rhône may have been the site of a Celtic oppidum or hill fort. Avignon, written as Avennio or Avenio in the ancient texts and inscriptions, takes its name from the Avennius clan. Founded by the Gallic tribe of the Cavares, it became the center of an important Phocaean colony from Massilia (present Marseilles). Under the Romans, Avenio was one of the most flourishing cities of Gallia Narbonensis, the first Transalpine province of the Roman Empire, but very little from this period remains. During the inroads of the barbarians, it was badly damaged in the fifth century and belonged in turn to the Goths, the kingdoms of Burgundy and of Arles, the Ostrogoths, and the Frankish-Merovingian kings of Austrasia. In 736, it fell into the hands of the Saracens and was destroyed in 737 by the Franks under Charles Martel for having sided with the Arabs against him. Avignon ceased to belong to the Frankish kings when Boso was proclaimed Burgundian King of Provence (then called Arelat) by the Synod of Mantaille, at the death of Louis the Stammerer (879). In 1033, when Conrad II fell heir to the Kingdom of Arelat, Avignon passed to the Holy Roman Empire. The German rulers being at a distance, Avignon was able to establish itself as a republic with a consular form of government between 1135 and 1146. In addition to the Emperor, the counts of Forcalquier, Toulouse, and Provence also exercised a nominal sway over the city. At the end of the twelfth century, the commune of Avignon declared itself independent, but this status was crushed in 1226 during the crusade against the Albigenses (Cathari) after the citizens refused to open the gates of Avignon to King Louis VIII of France and the papal Legate. They capitulated after a three months' siege (June 10 - September 13, 1226) and were forced—as punishment—to pull down the city's ramparts and fill up its moat. On May 7, 1251, Avignon was made a common possession of counts Charles of Anjou and Alphonse de Poitiers, brothers of French King Louis VIII the Lion. On August 25, 1271, at the death of Alphonse de Poitiers, Avignon and the surrounding countship Comtat-Venaissin were united with the French crown. 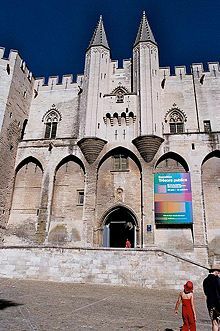 The Notre Dame des Doms cathedral is located in the heart of Avignon, near the Palais des Papes. French King Philip the Fair, who had inherited from his father all the rights of Alphonse de Poitiers, the last Count of Toulouse, turned them over to Charles II, King of Naples and Count of Provence (1290). In 1309, Avignon was chosen by Pope Clement V as his residence, and from March 9, 1309 until January 13, 1377 the city was the seat of the papacy instead of Rome. Queen Joanna I of Sicily, as countess of Provence, sold the city to Pope Clement VI for 80,000 florins on June 9, 1348. Although it was later the seat of more than one antipope, Avignon belonged to the papacy until 1791, when it was reincorporated with France during the French Revolution. This period from 1309 to 1377—the Avignon Papacy—was also called the Babylonian Captivity of the Pope, in reference to the Israelites' enslavement in biblical times. The analogy fitted Avignon in another sense—the venality of the papal court caused the city to become infamously corrupt, much as Babylon had been accused. The poet Petrarch condemned the city's corruption, contributing to the papacy's return to Rome out of embarrassment as much as anything else. The walls built by the popes in the years immediately succeeding the acquisition of Avignon as papal territory are well preserved. 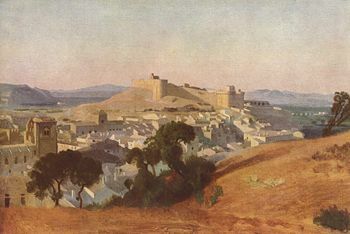 As they were not particularly strong fortifications, the Popes relied instead on the immensely strong fortifications of their palace, the "Palais des Papes." This lofty Gothic building, with walls 17 to 18 feet thick, was built from 1335–1364 on a natural spur of rock, rendering it all but impregnable to attack. After being expropriated following the French Revolution, it was used as barracks for many years but is now a museum. Avignon at the beginning of the fourteenth century, was a town of no great importance. It underwent tremendous development during the residence there of seven popes and two anti-popes, Clement V to Benedict XIII. To the north and south of the rock of the Doms, partly on the site of the Bishop's Palace, which had been enlarged by John XXII, rose the Palace of the Popes, in the form of an imposing fortress made up of towers, linked one to another, and named as follows: De la Campane, de Trouillas, de la Glacière, de Saint-Jean, des Saints-Anges (Benedict XII), de la Gâche, de la Garde-Robe (Clement VI), and de Saint-Laurent (Innocent VI). 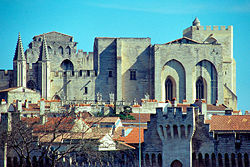 The Palace of the Popes belongs, by its severe architecture, to the Gothic art of the South of France; other noble examples can be seen in the churches of Saint Didier, Saint Peter and Saint Agricola, in the Clock Tower, and in the fortifications built between 1349 and 1368 for a distance of some three miles, flanked by 39 towers, all of which were erected or restored by popes, cardinals, and great dignitaries of the court. On the other hand, the execution of the frescoes which are on the interiors of the papal palace and of the churches of Avignon was entrusted almost exclusively to artists from Siena. 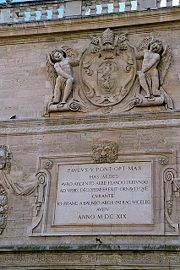 The popes were followed to Avignon by agents (factores) of the great Italian banking-houses, who settled in the city as money-changers, as intermediaries between the Apostolic Chamber and its debtors, living in the most prosperous quarters of the city, which was known as the Exchange. A crowd of traders of all kinds brought to market the products necessary to maintain the numerous members of court and of the visitors who flocked to it; grain and wine from Provence, from the south of France, the Roussillon, and the country around Lyon. Fish was brought from as far as Brittany; cloths, rich stuffs, and tapestries came from Bruges and Tournai. The university founded by Boniface VIII in 1303, had a good many students sponsored by the French popes, drawn there by the generosity of the sovereign pontiffs, who rewarded them with books or benefices. The papal return to Rome prompted the Great Schism, during which the antipopes Clement VII and Benedict XIII continued to reside at Avignon. The former lived there during his entire pontificate (1378–1394), the latter until 1403, when he fled to Aragon. After the restoration of the Holy See in Rome, the spiritual and temporal government of Avignon was entrusted to a gubernatorial Legate, notably the Cardinal-nephew, who was replaced, in his absence, by a vice-legate (contrary to the legate usually a commoner, and not a cardinal). But pope Innocent XII abolished nepotism and the office of Legate in Avignon on February 7, 1693, handing over its temporal government in 1692 to the Congregation of Avignon (i.e. a department of the papal Curia, residing at Rome), with the Cardinal Secretary of State as presiding prefect, and exercising its jurisdiction through the vice-legate. This congregation, to which appeals were made from the decisions of the vice-legate, was united to the Congregation of Loreto within the Roman Curia; in 1774 the vice-legate was made president, thus depriving it of almost all authority. It was done away with under Pius VI on June 12, 1790. The Public Council, composed of 48 counselors chosen by the people, four members of the clergy, and four doctors of the university, met under the presidency of the viquier (Occitan for vicar, i.e., substitute), or chief magistrate of the city, nominated for a year by the papal Legate or Vice-legate. Their duty was to watch over the material and financial interests of the city; but their resolutions were to be submitted to the vice-legate for approval before being put in force. Three consuls, chosen annually by the Council, had charge of the administration of the streets. Avignon's survival as a papal enclave was, however, somewhat precarious, as the French crown maintained a large standing garrison at Villeneuve-lès-Avignon just across the river. From the fifteenth century onward, it became the policy of the Kings of France to unite Avignon to their kingdom. In 1476, Louis XI, annoyed that Giuliano della Rovere was made legate rather than Charles of Bourbon, caused the city to be occupied. The king's troops were not withdrawn until his favorite had been made a cardinal. In 1536, King Francis I of France invaded the papal territory in order to drive out the Habsburg Emperor Charles V, who held Provence. In return for the reception accorded him by the people of Avignon, Francis granted them the same privileges as those enjoyed by the French, especially being eligible for offices of state. King Henry III Valois made a fruitless attempt to exchange the Marquisate of Saluzzo for Avignon, but Pope Gregory XIII refused (1583). In 1663, Louis XIV, due to an attack led by the Corsican Guard on the attendants of his ambassador in Rome, seized Avignon, which was declared an integral part of the Kingdom of France by the provincial Parliament of Provence. Nor was the sequestration raised until after Cardinal Chigi had made an apology in 1664. Another attempt at occupation made in 1688, without success, was followed by a long period of peace, lasting until 1768. King Louis XV, dissatisfied at Clement XIII's action in regard to the Duke of Parma, had the Papal States occupied from 1768 to 1774, and substituted French institutions for those in force with the approval of the people of Avignon. A French party grew up which, during the French Revolution, induced the Constituent Assembly to decree the union of Avignon with France on September 14, 1791. On June 25, 1793, Avignon and Comtat-Venaissain were integrated, along with the former principality of Orange, to form the present republican Vaucluse Department. Article 5 of the Treaty of Tolentino (February 19, 1797) definitively sanctioned the annexation, stating that "The Pope renounces, purely and simply, all the rights to which he might lay claim over the city and territory of Avignon, and the Comtat Venaissin and its dependencies, and transfers and makes over the said rights to the French Republic." In 1801, the territory had 191,000 inhabitants. On May 30, 1814, the French annexation was recognized by the Pope. Consalvi made an ineffectual protest at the Congress of Vienna in 1815, but Avignon was never restored to the Holy See. In 1815 Bonapartist Marshal Guillaume Marie Anne Brune was assassinated in the town by adherents of the Royalist Party during the White Terror. The town had significant religious status from ancient times. Traditionally, Saint Rufus, a disciple of Saint Paul, and Saint Justus were venerated in antiquity as bishops of that see. At least in tradition if not in history, it was thus the seat of a bishop as early as the year 70 C.E. The first bishop of Avignon known to history is Nectarius, who took part in several councils about the middle of the fifth century. St. Magnus was a Gallo-Roman senator who became a monk and then bishop of the city. His son, Saint Agricol, bishop between 650 and 700, is the patron saint of Avignon. Several synods of minor importance were held there, and its university, founded by Pope Boniface VIII in 1303, and famed as a seat of legal studies, flourished until the French Revolution. In 1475, pope Sixtus IV raised the diocese of Avignon to the rank of an archbishopric, in favor of his nephew Giuliano della Rovere, who later became Pope Julius II. The Archdiocese of Avignon still exercises canonic jurisdiction over the department of Vaucluse. In 1801, Avignon was reduced to the rank of a bishopric and was made a suffragan see of Aix. 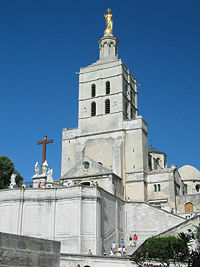 The Archdiocese of Avignon was re-established in 1822. In 1905, the Archdiocese of Avignon had 236,949 inhabitants, 29 cures (parishes of the first class), 144 parishes of the second class, and 47 vicariates. 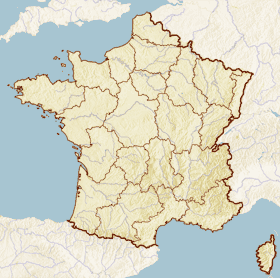 In 2002, as part of the reshuffling of the ecclesiastic provinces of France, Avignon came under the supervision of the Archdiocese of Marseilles, while nevertheless keeping its rank of archdiocese. Avignon is the préfecture (capital) of the Vaucluse département in the region of Provence-Alpes-Côte-d'Azur. It forms the core of the Grand Avignon metropolitan area (communauté d'agglomération), which comprises 12 communes on both sides of the river. 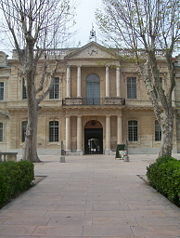 Avignon has courts, a council of trade-arbitrators, a lycée and training college, a chamber of commerce and a branch of the Bank of France. It is in a fertile district, trading in the products from its flour mills, distilleries, oil works and leather works, soap manufacture, chemicals and liquorice, and is well known for its sarsnet (a fine soft silk fabric often used for linings) and other fabrics. Avignon is served by the LGV Méditerranée high-speed rail. A well known theater festival is held annually in Avignon. Founded in 1947, the Avignon Festival comprises both traditional theatrical events and other art forms such as dance, music, and cinema, making good use of the town's historical monuments. Taking place every summer, approximately 100,000 people attend. There are really two festivals that take place: the more formal Festival In, which presents plays inside the Palace of the Popes and the more bohemian Festival Off, which is known for its presentation of largely undiscovered plays and street performances. Avignon is commemorated by the French children's song, "Sur le pont d'Avignon" ("On the bridge of Avignon"), which describes folk dancing. The bridge of the song is the Saint Bénézet bridge, over the Rhône River, of which only four arches (out of the initial 22) starting from Avignon side remain. In fact, people would have danced beneath the bridge (sous le pont) where it crossed an island (Ile de Barthelasse) on its way to Villeneuve-lès-Avignon. The bridge was initially built between 1171 and 1185, with an original length of some 2,950 feet, but it suffered frequent collapses during floods and had to be reconstructed several times. Several arches were already missing (and spanned by wooden sections) before the remainder was damaged beyond repair in 1660. Today, Avignon hosts a study abroad program for American students run through the Institute for American Universities (IAU). Classes focus on learning French, liberal arts and European history. Notre Dame des Doms.—The cathedral, is a Romanesque building, mainly of the twelfth century, the most prominent feature of which is the gilded statue of the Virgin which surmounts the western tower. Among the many works of art in the interior, the most beautiful is the mausoleum of Pope John XXII, a masterpiece of Gothic carving of the fourteenth century. Palace of the Popes.—The cathedral is almost dwarfed by the Palais des Papes, the Palace of the Popes, an impressive monument on a square of the same name. 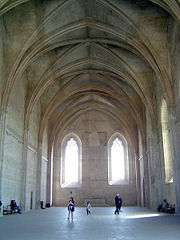 Begun in 1316 by John XXII and continued by succeeding popes until 1370, it is in the Gothic style. In its construction everything has been sacrificed to strength, and though the effect is imposing, the place appears more a fortress than a palace. However, its interior rooms, with their frescoes and impressive sense of space, provide a sense of the cultural richness of the papal court. Other buildings.—Among the minor churches of the town are St. Pierre, which has a graceful facade and richly carved doors, Saint Didier and Saint Agricol, all three examples of Gothic architecture. The most notable of the civil buildings are the Hôtel de Ville (city hall), a modern building with a belfry from the fourteenth century, and the old Hôtel des Monnaies, the papal mint which was built in 1610 and became a music school. Fortifications.—Avignon is still encircled by the ramparts built by its popes in the fourteenth century, one of the finest examples of medieval fortification in existence. The walls of great strength are surmounted by battlements, flanked at intervals by 39 massive towers and pierced by several gateways, three of which date from the fourteenth century. Bridges.—A bridge leads over the river to Villeneuve-les-Avignon, and a little higher up, a picturesque ruined bridge of the twelfth century, the Pont Saint-Bénézet, projects into the river. The Calvet Museum.—Named after F. Calvet, physician, who in 1810 left his collections to the town, this museum is rich in inscriptions, bronzes, glass, and other antiquities, and in sculptures and paintings. The library has over 140,000 volumes. The town has a statue of a Persian, Jean Althen, who in 1765 introduced the culture of the madder plant, (it has been used since ancient times as a vegetable red dye for leather, wool, cotton and silk) which long formed the staple for local trade. Musée Carnavalet.—Located in the Petit Palais at the end of the square overlooked by the Palais des Papes, boasts an exceptional collection of Renaissance paintings of the Avignon school as well as from Italy. Avignon theater festival website. www.festival-avignon.com. This page was last modified on 3 May 2016, at 14:59.